[275 Pages Report] Floating production systems are essential tools for offshore oil and gas developments which are solely dependent on these systems. They are used for drilling and exploration activities in offshore oil and gas production at all depths. They are of various shapes, ranging from ship shape, cylindrical spar shape, or semi submersible multi-hull shaped. They are used extensively across the globe wherever offshore drilling activities are taking place. These systems are of different types such as Floating Production Storage and Offloading (FPSO), Tension Leg Platform (TLP), spar, barge, and others. The build of floating production system depend on factors such as economic viability, drilling condition, and the need for custom-builds and generic production systems. The floating production systems market is directly dependant on offshore drilling activities carried out across the globe. The increase in demand for crude oil and the potential in oil and gas sources in offshore areas are compelling companies to drill at high depths and enter deep and ultra-deep waters. These are some of the key driving factors for the industry. The industry is segmented on the basis of their types which include Floating Production Storage and Offloading (FPSO), Tension Leg Platform (TLP), spar, barge, and others. Secondly, the global floating production systems market is also segmented on the basis of the water depth that they operate at, which includes shallow, deep, and Ultra-deep waters. The third segment is by build which is either new or converted. Lastly, the market is segmented on the basis of regions such as North America, Asia-Pacific, Europe, Latin America, Africa, and the Middle East. Each segment has been analyzed with respect to its market trends, growth trends, and future prospects. The data has been analyzed from 2011 to 2018, and all quantitative data regarding segmentation is mentioned in terms of value ($million). 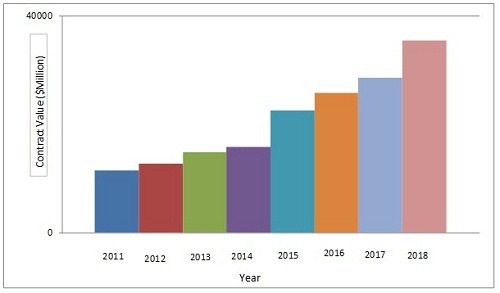 The global floating production systems market value is expected to reach $35.4 billion by 2018, growing at a CAGR of 18.9% from 2013 to 2018. The critical factors responsible for the growth of the industry include growth in offshore drilling activities globally, rise in offshore deep-drilling activities, and growing investments in offshore technologies. The key concerns in the industry pertain to environmental impacts and damages.. The floating production systems market is also analyzed with respect to Porter's Five Force model. Different market forces such as threat from suppliers, threat from buyers, degree of competition, threat from substitutes, and threat from new entrants, are analyzed with respect to the industry. The report also provides a competitive landscape of major market players that includes developments, mergers & acquisition, expansion & investments, agreements & contracts, new technologies developments, and others. A number of these developments are spotted by key industry players that suggest the growth strategy of these companies as well as of the overall industry. The report classifies and defines the contract value for the industry. It covers qualitative data of different types floating production systems. The report also provides a comprehensive review of major market drivers, restraints, opportunities, winning imperatives, and key burning issues in the floating production systems market. Key players in the industry are profiled in detail with their recent developments. Some of these include companies such as Samsung Heavy Industries (South Korea), Hyundai Heavy Industries Corporation Ltd. (South Korea), Keppel Offshore & Marine (Singapore), Malaysia Marine and Heavy Engineering Sdn Bhd (Malaysia), Daewoo Shipbuilding & Marine Engineering Co. Ltd. (South Korea), and Technip S.A. (France). The global floating production systems market is estimated to reach $35.4 billion by 2018, with a projected CAGR of 18.9%, signifying a high demand for these products and growth in offshore drilling activities. Floating production systems are used for offshore drilling and exploration activities along with some storage and offloading applications. They are used globally for offshore oil and gas developments. The high demand for crude oil, along with the rise in offshore production is driving the floating production systems market. The increase in the number of investments from operators, especially for deep and ultra-deep waters fuels the growth of the industry. FPSO dominates the global market with its versatility. The major geographic regions of the market are Latin America, the Gulf of Mexico, and Western Africa, where most of the offshore drilling activities take place. The global floating production systems market has witnessed a decent growth, based on the increasing demand for global energy, and the rise in the number of investments from operators and deep-water drilling activities. 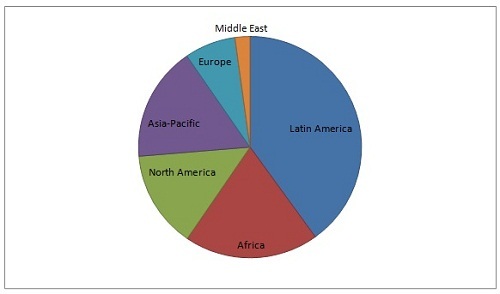 The biggest markets, based on geography for these systems are Latin America, Asia-Pacific, Africa, and Europe. Samsung Heavy Industries (South Korea), Hyundai Heavy Industries Corporation Ltd. (South Korea), Keppel Offshore & Marine (Singapore), Malaysia Marine and Heavy Engineering Sdn Bhd (Malaysia), Daewoo Shipbuilding & Marine Engineering Co. Ltd. (South Korea), and Technip S.A. (France), are the major players that constitute a major share of the global floating production systems market. Most of these companies mainly rely on growth strategies such as new-product launch, joint ventures & contracts, mergers & acquisitions, and investments & expansions in diversified geographic areas. The capital expenditure and operating expenditure of the exploration & production industry are huge in terms of value. To increase their geographical presence and market penetration, the companies have opted for agreements & collaborations. The major floating production systems types include FPSO, TLP, spar, barge, and others. FPSOs are the largest type in terms of orders booked. 4.6.1.2 Daewoo Shipbuilding & Marine Engineering Co. Ltd.
4.6.1.4 Keppel Offshore and Marine Ltd.
4.6.1.6 Mitsubishi Heavy Industries Corporation Ltd.
4.6.1.7 Pipavav Defense and Offshore Engineering Company Ltd.
4.6.1.8 Samsung Heavy Industries Ltd.
10.2 Daewoo Shipbuilding & Marine Engineering Co. Ltd.
10.3 Hyundai Heavy Industries Co. Ltd.
10.4 Keppel Offshore and Marine Ltd.
10.7 Pipavav Defence and Offshore Engineering Company Ltd.
10.8 Samsung Heavy Industries Co. Ltd. Figure 18 SWOT Analysis: Daewoo Shipbuilding & Marine Engineering Co. Ltd. Figure 23 SWOT Analysis: Pipavav Defence and Offshore Engineering Company Ltd.